Click here to view the community events section. The old railway station and Pioneer Park in the centre of town features picnic facilities, a wonderful water feature and an arts and craft store. Located off Ashfield Road 12 km south-east of Brookton. 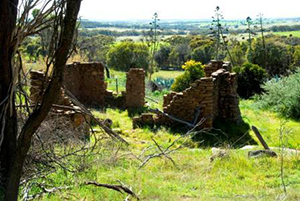 Best viewed in winter, the ruins of the old house and sheds were built from rock, natural clay and bush timber from his property in approximately 1900. Jack Hansen was of Danish descent and became known in the area as the `Animal Doctor`. 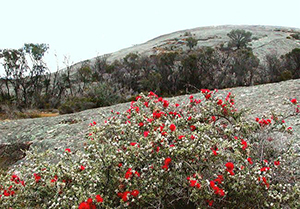 Nine Acre Rock is an ideal picnic ground in winter when the wildflowers are in full bloom and the view from this large expanse of rock is truly magnificent. 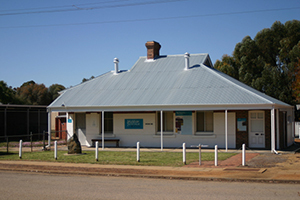 The collection reflects the "Changing Face of Brookton and Its Localities". The exhibitions include Grandma's "wash-house" and a horse drawn table top wagon that was payment for a block of land on which one of Brookton's hotels stands. Exhibitions are revamped periodically and tell stories of the people including the traditional owners, community organisations, businesses and services in the district. The archives are extensive and enquiries are always welcome. The Museum is open by appointment, phone 0427 334 051. Entry and research fees are available on application. Ten km south-west of Brookton is the Boyagin Rock Nature Reserve. Boyagin Rock is an imposing outcrop which has been cracked and pitted by weathering. Boyagin Rock is a place of great cultural significance to Nyoongar people, who call it Boogin. They believe that if you walk to the top of the rock without stopping you will live a long life. Boyagin provides a refuge for a variety of wildlife including numbats, goannas, echidnas and Tammar wallabies. Take a walk through the woodlands and listen for the ringing call of the grey currawong whilst you look for the native orchids and other rare plants that grow in the Reserve. Just 2km before reaching Brookton from Perth on the left side of the road (signposted). 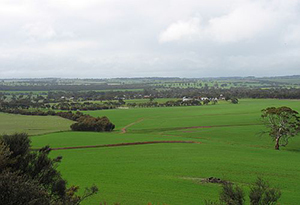 View the farming land, surrounding bushland and the townsite of Brookton.